Life-Size Santa's Sleigh is a charming centerpiece for any holiday display. Composed of iron, hand painted and powder coated, the material is designed to withstand the wear and tear of the outdoor elements that come with the season. Built to hold 650 lbs, this sleigh is perfect for photo opportunities for the kids. 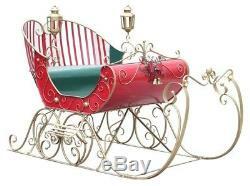 This sleigh will add Christmas spirit to any home, garden, or store front. Product Dimensions: 80" L x 39" W x 47 H. Life-Size Sleigh perfect for photo oppurtunities. Powder coated to withstand elements of the season. The item "Life-Size Christmas Victorian Santa Sleigh Iron Commercial Christmas Decoration" is in sale since Tuesday, November 20, 2018.